Not long now until the group’s ninth anthology is launched. Everyone is invited to help us celebrate 20 years of meeting together and writing. Our community writing group has been meeting at the Mordialloc Neighbourhood House for twenty years and for our anniversary anthology we reflect on our relationship with the City of Kingston. We have reminisced about wartime precautions on Parkdale beach and the transformation of suburban streets by developers. We have reflected on the City of Kingston’s creation by negotiation and amalgamation, Patterson Lakes created by feats of engineering. There are snapshots of dances at Moorabbin Town Hall, surf lifesaving carnivals, Edithvale billycart shenanigans and cycling to school, the demise of horses and the rise of hoons, joyous beach weddings and sad farewells. Stories woven around everyday life and observations to trigger your own memories. Perhaps you’ll recognise the places and characters, the community groups and events, remember when the pace of life seemed slower, be grateful for improved services. As you enjoy this collection I’m sure you’ll come to the same conclusion as the writers – Kingston is indeed a great place to live. This collection of writing from the Mordialloc Writers’ Group again features new writers as well as writers from previous anthologies. It is a special book celebrating our 20th anniversary including guest writers who can no longer attend because they’ve moved location. They were a link in our journey and still consider themselves ‘Mordy’ writers. Over sixty-five writers have had the opportunity to be published authors under the auspices of Mordialloc Writers since 1995 – a proud achievement for a small group. 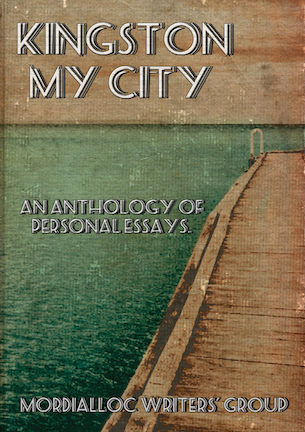 This year, we concentrated on the personal essay format choosing as our theme the City of Kingston. What does it mean to be born here? Attend school or grow up here? To live, work, or visit the various suburbs that make up Kingston? Each writer’s interpretation, their observations, reflections and memories will entertain, perhaps strike a chord and hopefully linger in your memory. < Previous What Can Poetry Teach Us? For the past twenty years Mairi has been founder, co-coordinator, payer of writing group rent, chief editor, apple cake provider and driving force behind Readings by the Bay and the Mordialloc Writers’ Group. We meet every Tuesday to workshop, refine and read sections of our work in progress. This community support and assistance, especially from seasoned authors like Mairi is invaluable and creates long lasting friendships. It also ensures the memoir, short story or poem is reworked and polished to a publishable standard. Ideas are swapped, story lines discussed, achievements applauded and rejections seen as stepping stones on the pathway to publication. All the members associated with the Mordialloc Writers Group take pride in launching this latest anthology, but we all know, without the expertise, enthusiasm and dedication of Mairi it just wouldn’t happen. Looking forward to a launch day of fun, good cheer and laughter.